These Millipedes Can't Hear, So Why Do They Sing? Why would a young male sing when his species has no ears? To get the girl, of course. That’s the most likely explanation for noises made by Sphaerotherium, a little-known genus of giant pill millipedes found in South Africa. Exactly why sound should be so important to creatures incapable of hearing is a puzzle, though one not often considered even by entomologists. The last scientist to wonder died tragically almost 40 years ago, before he could answer the question. 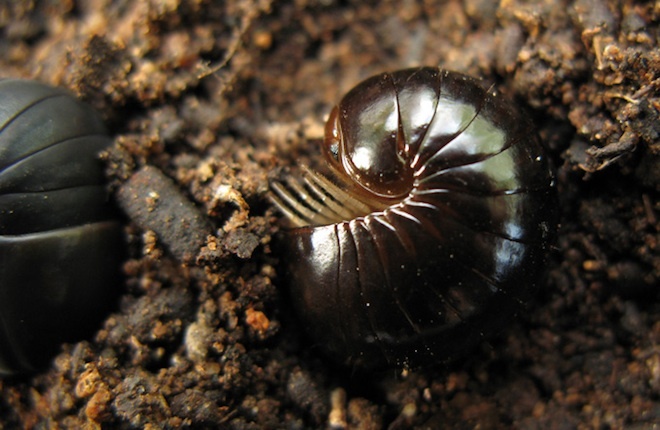 With more taxonomic families than entomologists to study them, many millipede species have been largely ignored since being discovered — an ignominious fate for a class of creatures directly descended from the first waves of animals to colonize land some 400 million years ago. So it was with Sphaerotherium. Before Wesener, they were last studied by a young German entomologist named Ulrich Haacker, who in the late 1960s was a rising star in his field. In 1972, he traveled to South Africa, fixing his attentions on the nine noisy species of Sphaerotherium, one of the few millipede groups to produce any noise at all. Haacker collected hundreds of specimens. He filmed and recorded them, methodically noting which animals made what sounds, and when they did it. It was the most thorough Sphaerotherium examination ever undertaken. But shortly after returning to Germany, he was diagnosed with a rare form of leukemia. Six weeks later, Haacker died. The collection passed to one of his students, Stefan Fuchs. He went on to study honeybees, but carried Haacker’s massive box of millipedes from office to office until, in 2005, he read about Wesener’s discovery of a giant pill millipede species in Madagascar. Fuchs contacted Wesener. Joined by German zoologists Jörn Köhler and Didier Van den Spiegel, they set about bringing Haacker’s lost work to life. An obvious clue to Sphaerotherium sounds — which technically are not singing, since millipedes don’t have voices, but rather stridulations generated by rubbing body parts together — is that only males make them, implying some reproduction-related function. Still, the baffling fact remained that giant pill millipedes can’t hear. But another clue came from Haacker’s notes: Males stridulated primarily when encountering giant pill millipedes that had rolled into their eponymous, ping pong ball-sized defensive posture. As Sphaerotherium lack the poison glands typical of other millipedes, retreating into an armored ball is an all-purpose response to any approaching creature, their own species included. Rolling, of course, is great for defense but inconvenient for mating. And though defenses against unwanted male attention are common in the animal kingdom, rolling into a ball would discourage desirable suitors, too. Wondering if stridulations might somehow convince wary females to uncoil, Wesener’s team analyzed the stridulations in spectrographic detail and found species-specific patterns that varied in timing rather than pitch, like Morse code. “Females probably recognize the vibrations of the male,” said Wesener. Indeed, millipedes have fine hair-like structures on their legs, used for detecting the movements of prey but appropriate to this purpose as well. For now, this remains a hypothesis, though a very plausible one. So does the origin of stridulations, which appear to come from back-and-forth rubbing of guitar-and-pick formation on the millipedes’ pincers. Wesener hopes that other scientists will continue Haacker’s investigations. Another open question is why, when departing after mating — a process that can last for an hour, involving a delicate and complicated series of acrobatic movements — male Sphaerotherium sing one more time. Comparative questions also fascinate Wesener, who said stridulation is found in both male and female giant pill millipedes in Madagascar. “Maybe they’re singing a duet,” he said. Citation: “How to uncoil your partner —“mating songs” in giant pill-millipedes (Diplopoda: Sphaerotheriida).” By Thomas Wesener, Jörn Köhler, Stefan Fuchs and Didier van den Spiegel. Naturwissenschaften, Vol. 98 No. 11, November 2011.